For 15 years, Fundación EcoAndina has developed and implemented the AndeanSolarVillage concept, in which solar energy plays a key role. 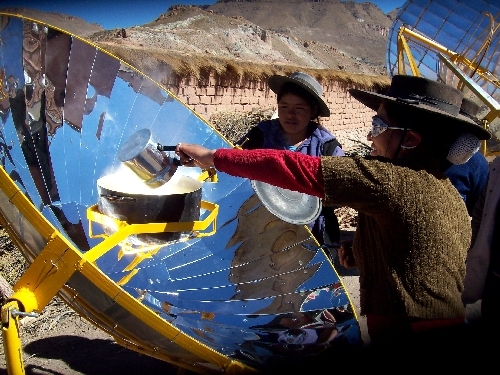 People in more than 20 Andean villages prepare their meals in solar cookers, they use solar collectors for warm water, their homes are illuminated by solar energy and their children learn in solar acclimatized class rooms, small farmers use solar powered water pumps for Andean crop plants. The first solar kiosks sell healthy fast food in the streets. Most of these solar devices are manufactured in northwest Argentine. EcoAndina activities had an impact on public policy: Jujuy was the first argentine province in implementing a solar energy program (cookers, warm water and acclimatization) in rural public primary schools. Actually, Jujuy is first in planning a solar powered pumped-storage hydropower plant in the Puna (Andean highlands), in witch EcoAndina is involved as a consultant. The German NGOs Oekoandina e.V. and Fair Planet e.V. are cooperating with EcoAndina; their professionals give us valuable support in technical, economical and organizational issues. Our German counterparts help us to establish contacts to German government agencies (BMZ), to institutions (Wissenschaftspark Gelsenkirchen), to research centers (SolarinstitutJülich) and to private companies (JUWI AG Wörrstadt). By means of the SEPS Project “Carbon Credits in Benefit of Andean Solar Villages” (2007 to 2009), EcoAndina and associated NGOs had demonstrated their operational capacities by managing a project that got involved indigenous population in the Puna, argentine public authorities and European CO2 trading companies. CAMAF - Camara Argentina de Fabricantes de Maquinaria y Equipamiento para la Agricultura Familiar. EcoAndina represents the area Renewable Energies within the Argentine Board of Manufacturer of Machinery and Equipment for Family Farming. On that solid basis of successful realized projects and activities, EcoAndina wants to extend its solar concept to solar mobility. Electro mobility is an upcoming topic within the argentine public discussion. In Buenos Aires, e- mobility is promoted as “ecological” mobility, because it avoids air pollution and acoustic pollution, but there is still no public conscience about the importance of the question how the energy for e-mobility is generated. Argentine has a high potential for wind and solar energy, but renewable energies are almost not very present in public opinion. 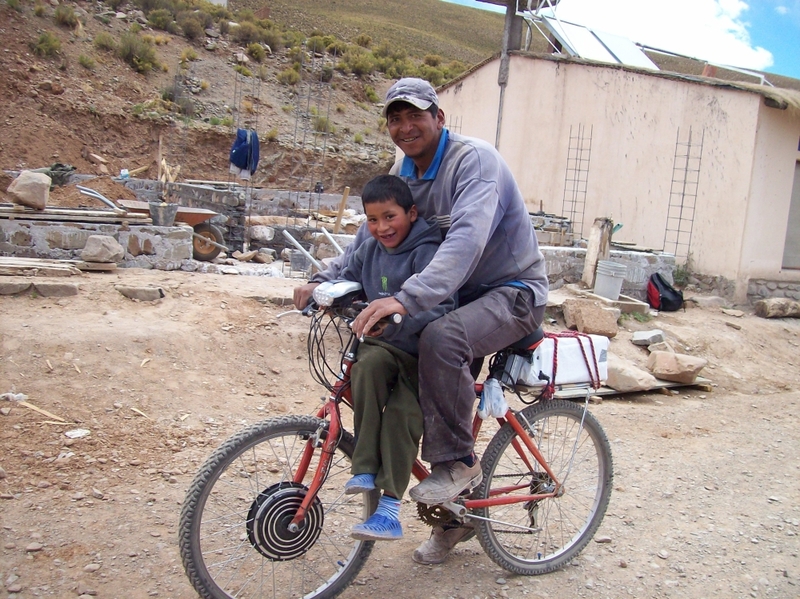 Actually, EcoAndina is one of the first voices that bring mobility concepts and renewable energy concepts together. By means of the present project, EcoAndina will demonstrate in small scale and in concrete and practical cases that electro mobility on basis of solar energy is possible. We will test a set of technical, economical, social and cultural parameters which we consider important for a possible switch to non fossil mobility. One consists of the introduction of new and to the moment unknown mobility technologies (electric vehicles and solar service stations), their practical application in one rural and other urban area and their adaptation to local conditions. This part is managed by the technical project manager Barbara Holzer, expert in solar energy with large working experiences in the Puna. She is also in charge of the relations to indigenous communities on the Altiplano. The second key issue consists of the introduction of innovative and ecological mobility concepts in the agendas of decision makers and opinion formers. This part is managed by the institutional project manager, Silvia Rojo, expert in social communication with large working experiences in directing NGO´s. She is responsible for the relations to the above mentioned institutions and networks and for the relations to local governmental authorities. She is also in charge of public relations in general. Both directors are supported by a team of professionals in the areas hydrology, geology, industrial design and publicity; by technicians skilled in construction, in mechanics and in electromechanics and by an administrative secretary. One is Ecohuasi in Misa Rumi village located in the heart of the Puna at 3.700 meters above sea level. At Ecohuasi, EcoAndina has built up a technology park which shows all the solar devices and technologies that are promoted by EcoAndina in the Puna. In addition to solar techniques we also demonstrate cultivation of Andean crop plants by drop irrigation, ecological water- and wastewater management and solar architecture. At Ecohuasi we have a well-equipped workshop and a conference room at our disposal. Ecohuasi offers lodging and workplaces for up to 12 persons and, starting from January 2014, there will be internet available. A recently finished seminar room gives place for thirty people. Parting from Misa Rumi, five more Andean villages can be reached by a road and path network within a 30 kilometers radius. The next town is La Quiaca at 120 kilometers distant via not tarmaced national road number 40. The distance from Misa Rumi to San Salvador, capital of the Jujuy province, is 380 kilometers. EcoAndina´s other operation base is the interpretation-center for renewable energies (CEDIERA) in San Salvador, which has got support from local governmental institutions, from the German Embassy and from private argentine companies. In CEDIERA´s workshop, equipped with metal processing machinery, solar collectors and other solar devices are manufactured. Workshops are given in the conference center built up in solar architecture design. Different solar technologies are in exhibition on the large ground surrounding the buildings. CEDIERA´s concept consists in offering an interpretation center for renewable energies to the public en general. Special activities are directed to particular target groups, such as officials of public administration, or students of technical careers. In the Andean area, indigenous people have lived for centuries in a very mobile way by walking long distances. The private use of fuel powered vehicles is emerging quite recently. Frequently, the families´ economic situations don’t allow adequate purchase and maintenance of cars and pick-ups. In addition to the shortage of economic means the Andean population also suffers a lack of fuel supply, of service stations and spare parts. We think that e-bikes (pedelecs) and e- motorbikes would meet much better the daily mobility needs and the economic possibilities of many Puna inhabitants. As the Puna is a region with extremely high insolation values, it is logical that e- mobility will be based on solar energy, which is available at cero costs practically all days of a year. Good natural conditions for solar energy combined with good user acceptance, proved by former solar projects, give an excellent point of departure for the pilot project “Solar Mobility in Andean highlands of Argentine”. It is also a good moment and place for starting a debate about sustainable mobility, because we are in front of a relatively “open” situation in respect of mobility and transportation in the Andean region where fuel based infrastructure is not yet established and where different and alternative paths are still thinkable. The project experiences and results will be divulged by EcoAndina in the different networks mentioned above. Positive experiences could be replicated in several other argentine provinces which are located at the border of the Andean Cordilleras and which present similar climatic and socioeconomic conditions. As we observe that indigenous people in the Puna actually spend substantial parts of their incomes on communication and on (fossil) mobility, we are convinced that people are ready to spend money also on solar mobility if they are committed to its benefits. In the beginning, solar mobility starts with e- bikes and motorbikes, because these devices are available on the argentine market and because there exists already a local infrastructure for service and maintenance. For the purpose of divulgation of the benefits of solar mobility, in a first phase we loan the e-bikes to multiplicators, such as it is e.g. the local paramedic who has to visit his patients or the cooperator of the farmer’s cooperative who has to go to the crop areas in the mountains. Later on, when people will have got the opportunity to make their first positive experiences with solar driven e-bikes, we expect that private demand for solar mobility will emerge. The project’s vehicles will be rent to interested people and by that way, some funds for further operation and maintenance of the Ecohuasi based service station will be generated. We also anticipate that people will be willing to buy their own e-bikes. EcoAndina will thereby help to bring provider and consumer together. A pre-existing infrastructure of small bike shops and repair centers in the Puna towns and villages can be used easily for solar bikes, too. Local bike mechanicals will be trained in e- bike operation and maintenance. The general situation in San Salvador de Jujuy is quite different. Here is the fuel based mobility infrastructure well established. Chaotic traffic and high pollution stress the city and its inhabitants every day. In San Salvador de Jujuy, there is the seat of the provincial government and there also reside many other decision-makers and opinion formers. On these grounds, we consider it vitally important that solar mobility also happens in San Salvador and surroundings. At EcoAndina´s Center CEDIERA we install a Solar Service Station and we run several e-bikes with the intent to demonstrate the viability of solar mobility to the public. In 2013, EcoAndina has started with workshops for technical students at the CEDIERA center. Further agreements on cooperation with technical high schools are projected in the year 2014. By this means, EcoAndina begins forming human capacities for future challenges related to alternative mobility technologies. The institutional project- coordinator will focus on placing solar mobility on the agenda of relevant authorities, of important institutions and networks. Within the scope of the present project, EcoAndina will organize events for awareness raising about the fossil energy problematic and events for divulgation of the benefits of solar mobility. In a first step, we aim to achieve that San Salvador’s town council declare the public interest in the solar mobility project. We also look forward to involve the community of the nearby Yala, a small village which has declared itself “green village”, where several ecological projects are going on. Later on, we possibly will get to declarations of interest obtained from the province government and from other municipalities, too. The project could be the kick-off for a paradigm change in the Andean region, by initiating public debates on new, innovative and non-fossil mobility concepts in urban and in rural areas. EcoAndina works in this project closely with the partner organization OekoAndina e.V. in Germany together. The project is funded by means of WISIONS, through Agenda 21 in Gelsenkirchen, private companies and private donors.